With the birth rate down by 48% since 1960, teen pregnancy down by 65% since 1990 - single motherhood is UP by 800%. [A] Why? In the "Jane Crow" era "MEN ARE DISFAVORED BY AMERICAN DOMESTIC RELATION LAW." I (DGJeep) have been impoverished by my 14 year effort, I have been homeless for over 10+ years, I have been through the Federal District and Circuit courts 12 times and to the Supreme Court of the United States 7 times. I spent 411 days in Jail, before all charges were dismissed. I have submitted TWO psychiatric exams - both confirming my SANITY and my COMPETENCY!!!! I doubt the absolutely corrupt Black Robed Royalist Judiciary could, en masse, could say the same. Jane Crow, Juvenile Crow and Jim Crow are all based on the conviction/lynching by infamous accusation without access to 4th, 5th and 14th Amendment’s SECURED Justice with the equal protection of due process of law. There was and is a historical preference for the “Jane Crow” era, similar to the “Jim Cow” era. The “Jim Crow” era was initiated based on the non sequitur, "Black Men can not be trusted around White Woman." The “Jane Crow” era was initiated based on the non sequitur, "Men can not be trusted around Children and Woman." The “Jane Crow” Era started with, “The Child Abuse Prevention and Treatment Act (CAPTA) is one of the key pieces of legislation that guides child protection. CAPTA, in its original inception, was signed into law in 1974 (P.L. 93-247). It was reauthorized in 1978, 1984, 1988, 1992, and 1996, and with each reauthorization, amendments have been made to CAPTA that have expanded and refined the scope of the law. CAPTA was most recently reauthorized on June 25, 2003, by the Keeping Children and Families Safe Act of 2003 (P.L. 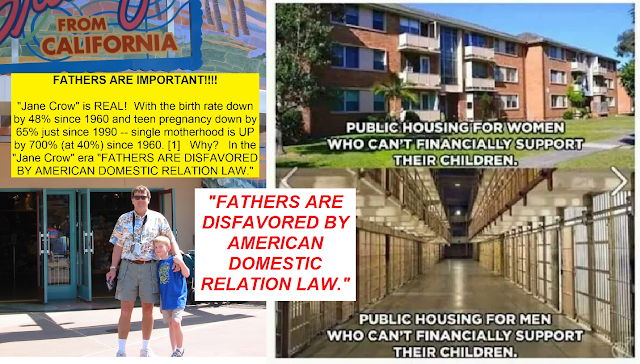 108-36).” There was a decided preference for Mother’s right over Father’s rights in the unequal enforcement of the law. The cost of 1/31/1974 Public law 93-247.Provides authorizations for fiscal years 1974 through 1977 of, respectively, $15,000,000; $20,000,000 $25,000,000 and $25,000,000. The appropriation for PUBLIC LAW 108–36—JUNE 25, 2003, just for family violence has now risen to $175,000,000 for each of fiscal years 2004 through 2008. That was followed up by Joe Biden's good intention, “The Violence Against Women Act of 1994 (VAWA) as a United States federal law. It was passed as Title IV, sec. 40001-40703 of the Violent Crime Control and Law Enforcement Act of 1994 HR 3355 and signed as Public Law 103-322 by President Bill Clinton on September 13, 1994. It provided $1.6 billion to enhance investigation and prosecution of the violent crime perpetrated against women, increased pre-trial detention of the accused…” ‘‘Violence Against Women and Department of Justice Reauthorization Act of 2005” has been funded through 2011. There is a federal authorization of “$225,000,000 for each of fiscal years 2007 through 2011’’. It is GOVERNMENT gone WILD. Statistically speaking I do not think anyone would assert a Domestic Violence rate of 1incidents of violence / 100 couples. But today we have a divorce rate of 1 out every 2 couples. An Ex-Parte Order of protection in a divorce action is a NO LOSE petition for the woman. They are granted wholesale, without foundation at a rate of 9 out of 10. With a divorce rate of 50 out of 100 and an Ex-Parte rate of 45 out of 50 you have an effective rate of 45 out of 100 being force fed the cure for a disease that only effects 1 out of 100 couples. So there are 44 out of 100 males that are being illegally and unconstitutionally deprived of their paternal ad property rights. [A]"Women just aren’t that into the ‘marriageable male’ anymore, economists say" Washington Post - By Danielle Paquette - May 16, 2016 - "The Fracking Boom, a Baby Boom, and the Retreat From Marriage" Freakonomics – NPR - July 5, 2017 - Andrew Cherlin, professor of sociology at Johns Hopkins University, Melissa Kearney, professor of economics at University of Maryland. The illegal judicial preference for a Mother’s (woman) rights over a Father’s (man) rights with the UNEQUAL protection of the law. The original quote listed (209A) This refers to the statute the result of 1978 Abuse Prevention Act in Massachusetts. Could be MO. (in psychology) the failure of a defense mechanism. Sheara F. Friend, as quoted in “The Booming Domestic Violence Industry” - Massachusetts News, 08/02/99, By John Maguire. That describes my first year under an order of protection perfectly!!!!!!!!!!! "Jane Crow" is REAL! Today's domestic relations law disfavors men. "In the United States, 40 percent of children are born to unmarried women, the most recent data from the Centers for Disease Control and Prevention show." 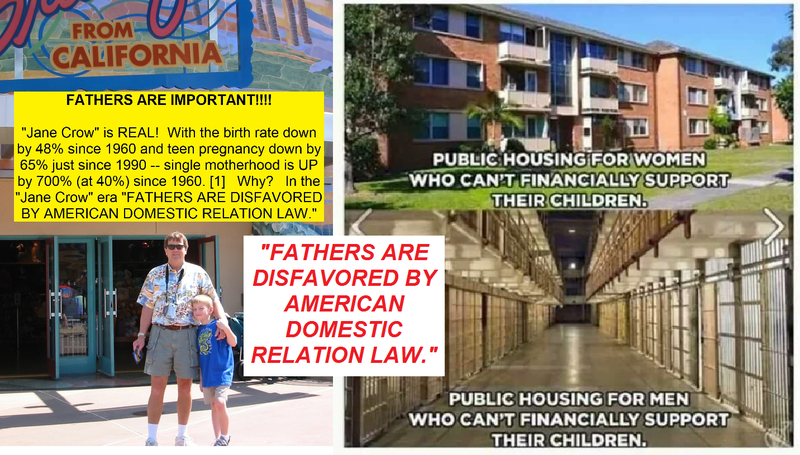 The American legal system in America favors woman as custodial parents. The best men can hope for is part-time parenting and child support payments - AT BEST!! The issue for your consideration is - can men be disfavored under the 14th Amendment's requirement for "equal protection of the law? Ø that the facts were and are “beyond debate” (Ashcroft V. Al-Kidd 563 U. S. _(9)_ (2011) - Mullenix v. Luna 577 U. S. ____ (2015)) “sufficiently clear that every reasonable official would have understood that what he is doing violates that right,” (Ashcroft V. Al-Kidd 563 U. S. _(9)_ (2011) - Anderson v. Creighton, 483 U. S. 635, 640 (1987)) an INFAMOUSLY-SCANDALOUS EXTRA-JUDICIAL GRAVAMEN (i.e., the universal reckonable understanding of the I, IV, V, VI, VII, VIII and XIV Amendments).